Ten days in Singapore, and the food situation is dire. Whatever paradigm you use – loss of aura, pastiche, simulacra – they all apply. Neoliberalism has wrought urban renewal and franchising. Many legendary street food vendors are simply history. Malls everywhere, with their food courts modeled after colonial style coffee shops. You can’t walk 100 feet without hitting another, but they’re abominations. I can’t list all the examples, but I can cite one from personal experience. 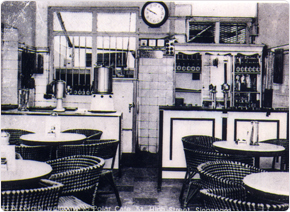 There used to be this cafe in a row of shophouses called the Polar Cafe. It served coffee (I mean real coffee) and a selection of pastries, and only that small selection of pastries. It was cooled by ceiling fans, had marble table tops, wooden-rattan chairs, and mosaic flooring. It was in the colonial downtown area on High Street, and I remember going there with my mother for tea-time snacks before walking over to city hall to ride home with my father. The restaurant is gone, of course. In its place? 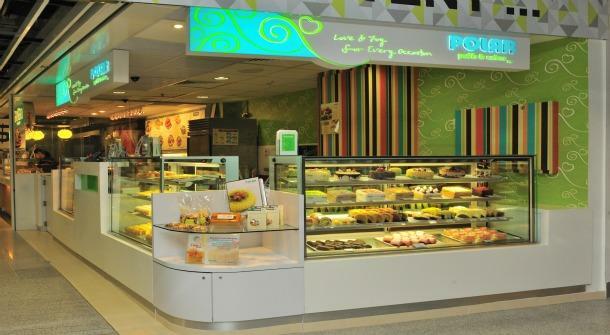 Franchised outlets that get their food from a central kitchen, which also stocks Polar-labelled display cases in things like the 7-11. I saw one of these glass cases the other day, moved towards it by pure instinct, then remembered the original location, and swiveled away in disgust. The website tracks the death of food culture quite ably, as a matter of fact. So, what does this mean for the Lemurs or anyone else going on a street food pilgrimage? Will you feel like it’s paradise without any knowledge of history? Yes, probably. But you’ll need a good guide to show you where the genuine articles are still available, prepared by unalienated labor and unsullied by Taylorism. Today I just took the bus 20 minutes to the Haig Road market for some putu piring. Oh putu piring. Still made by a group of Malay women hunched over a small assembly line, ending in a cluster of little steamers. It was mesmerizing then, and it’s mesmerizing now. Yes it’s hot, everyone’s sweaty, and no, it’s not a freakin food court, but you line up with the locals and the odd expat or foodie tourist who’s read about it somewhere because it’s pure culture. 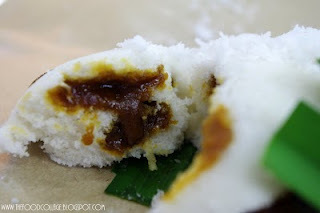 $2 gets you 5 of these heavenly cloudlets of palm sugar and grated coconut. I brought 3 packets back to my mother’s house and finished all 15 in under 10 minutes. When my mother sees putu piring, she’ll always say “this used to sell at 3 for $1.” Yes mom, I think we can still afford it. Yesterday, in between screenings of the Japanese film fest at the national museum – why work while on vacation? 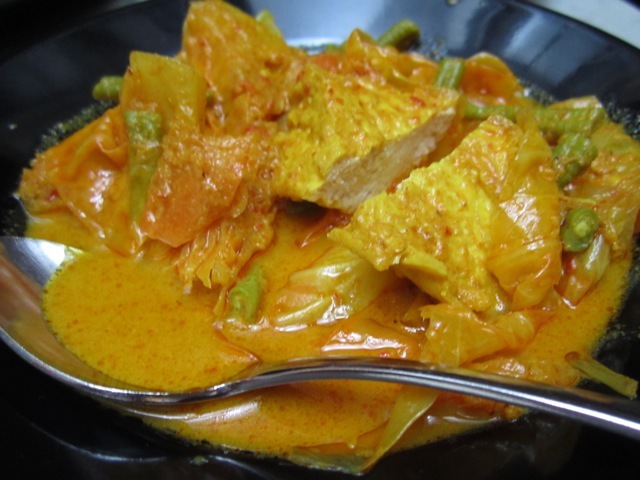 I dunno – I walked and earned a little sunburn on the way to Killiney Road for Indonesian food. You know it’s good when skyscrapers surround a little row of 2 storey shophouses on all sides. Ayam kuning, beef rendang, and sayur lodeh (google them), then 2 glasses of kopi tarik. You can say I have a thing for marble table tops. it’s an honest, honest plate of food. A simple, simple joy. 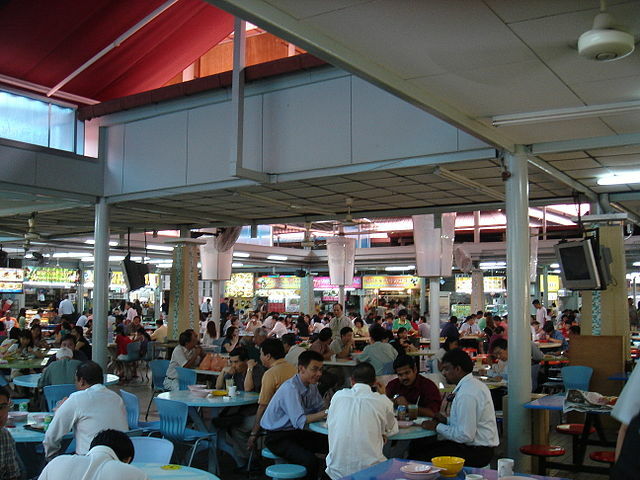 Image by bookjunkie from singaporeactually.com. 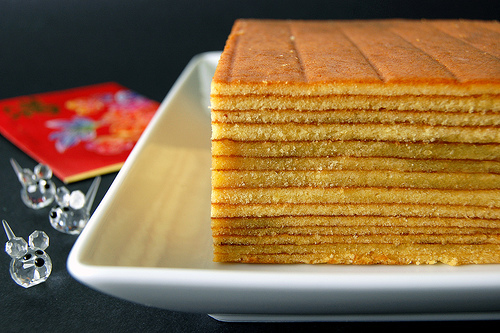 Two weeks before I flew out, I emailed my mother to ask her aunt to bake me a kueh lapis, an insanely labor intensive layer cake of postcolonial origin, with enough butter and yolks to make the French seem almost Japanese. I know that people often make these subjective and unverifiable claims about their family’s cooking, so you’re going to have to trust me on how good my great-aunt’s kueh lapis is. Look at this recipe. Spread a layer, bake, repeat at least 15 times. If you don’t take your time, the dark layer won’t be distinct, and you have crappy cake. So it’s a whole production. I knew what i was asking an 80+ year old woman to do, but she lives with her daughters, and I was willing to trade on their memories of my childhood cuteness. My mother didn’t reply to that email. And when I reminded her of that special request about a day into my visit, she said that it was impossible. Her aunt, in my mother’s words, “is now demented. You’ll have to get it at Bengawan Solo.” It’s an Indonesian bakery franchise. Distraught that I had eaten the last of my great aunt’s kueh lapis, I bought some from Bengawan Solo. Inedible. Absolutely inedible. When the chain had just a handful of stores, the cakes were an acceptable facsimile. I wouldn’t be surprised if there are now 40. It’s easy to forget with as many stores to rival McDonald’s, that Bengawan Solo has origins in someone’s kitchen too. Now that exists only in the “About Us” section on the company website. A cake from that original kitchen would’ve been good, I’m sure. But not like my great aunt’s. And now it’s all gone. It’s enough to make you demented. Oh my, I missed Indonesian and Malay food so much. Putu piring oooh I missed you so. My mom can make the Kue Lapis here in the state but it takes her a looong time so she doesn’t make them very often -_-. Kueh Lapis is on my list of things to learn how to make myself…but it’s a daunting task!